The Glen boys gathered again for another evening of excesses at Garibaldi, 9th February 2015, where Roberto the chef and owner had customised a menu for us. The original intention was to drink a 2004 horizontal of Margaux, seeing how infrequently this commune is featured in most tastings. However, it wasn’t quite possible to sustain the plot across a diverse group of people and we ended up drinking whatever people brought. We began with a 2004 Dom Perignon (courtesy of Miah Hiang) that bolted off the blocks with a powerful earthy pungency and concentrated white citrus, light touch of lime and pomelo and a glimpse of mint intermixed very fine gentle bubbles, eventually developing overtones of vanilla and sweet toasty oak. Highly cerebral and complex and really quite superb. In contrast, the regular yellow label Verve Cliquot (courtesy of Beow Kiong) was rather stern in character with notes of limey citrus, green apples and bittersweet pomelo, weighty and linear from entry to finish, veering towards overt dryness. 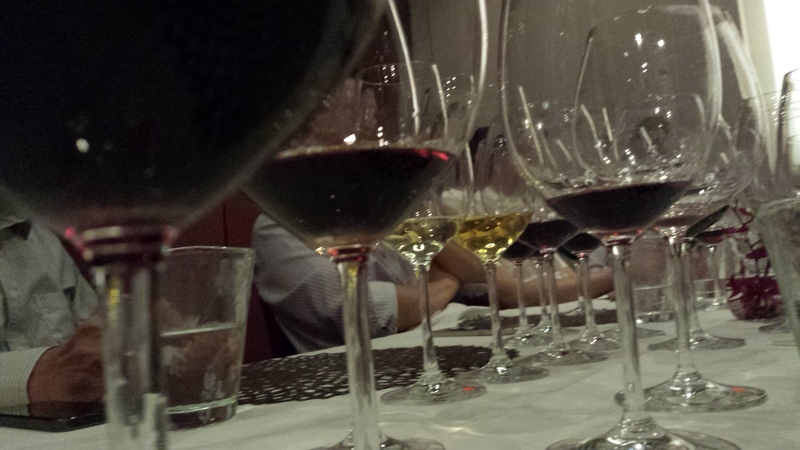 We moved on to a pair of white burgundy, both courtesy of Choon Jin. The 2011 Guy Amiot Chassagne Montrachet La Maltroie 1er was highly attractive with a lovely and generous bouquet of white petals, placid and gentle on the palate with understated sweetness, taking on greater weight and expanse over time. Next to it, the 2009 Henri Boillot Savigny-les-Beaune Les Vergelesses 1er, whilst hailing from a great vintage, didn’t seem quite ready to drink at this stage although one senses an abundance of quality fruit beneath the even and smooth surface, toned with a hint of richness and delicate minerality, but still largely undeveloped. A third white, the 2004 Mischief & Mayhem Mersault Les Poruzots 1er (courtesy of Keng Hong) was much heavier in color with the advantage of significant bottle age, featuring generous notes of caramel and red apples on the nose although disappointingly short on fruit on the palate; it desperately needs more fullness and body. The series of reds got off to a poor start, a potentially delicious bottle of 2001 Nicolas Potel Echezeaux Grand Cru turning out to be significantly corked. It never fails to amaze me how many people who drink very regularly and are knowledgeable about wine cannot recognise a corked wine whenever the encounter arises. On the other hand, the 2006 Taupenot Merme Mazoyeres Chambertin Grand Cru (courtesy of Hak Mien) was an absolute beauty, displaying a wonderful purity of red fruits and camphor, highly attractive in concentration and intensity without the outright voluptuousness of a first-division grand cru of Chambertin, very refined and quintessentially burgundian. Very good indeed, providing the ideal platform from which to move on to the wines of Margaux, finally. It turned out that only Ch Palmer and Ch Margaux were featured, with two different vintages available for each, an ideal situation for easy pairing and comparison. The 2004 Ch Palmer (courtesy of Vic) was a classic beauty with open textures and an abundance of ripe dark fruits and dark currants of excellent depth, classically structured and balanced, its tannins slightly chewy and velvety, its aromas more lifted over time with nothing out of proportion, confirming just how under-rated this vintage has been. In contrast, the 2002 Ch Palmer, a bottle I’d cellared since its initial release, was also quite excellent, striking a perfect balance between loads of black fruits and the high-toned salty minerality, very seamless, just missing in sheer opulence. This is a wine that can hold its own in any line-up, a reminder never to under-estimate better estates in so-called weak vintages. The 2002 Ch Margaux (courtesy of Li Fern) was similar in many ways to the 2002 Palmer with good saturation of black fruits and dark currants, possessing greater depth and layering, matched against earthy minerality, just a tad short at the finish. Its deficiencies were shone up by the 2003 Ch Margaux (courtesy of SS Ngoi), a prodigious wine of immense breadth and depth, layered with outstanding dark fruits and redcurrants, rich and lush without being overbearing and, naturally, still youthful with absolutely no trace of burnt from the hot vintage. Just when we had concluded dinner and about to leave, Hsiang Sui came with a clutch of offerings that was difficult to refuse. The 2007 Kistler Russian Valley chardonnay was dry, lean and austere with a metallic tone towards the finish, while a 2000 Pavillon Rouge was well into its secondary development with notes of cedar and sweet tannins, slightly lean but its breed shone through. Definitely quality stuff. 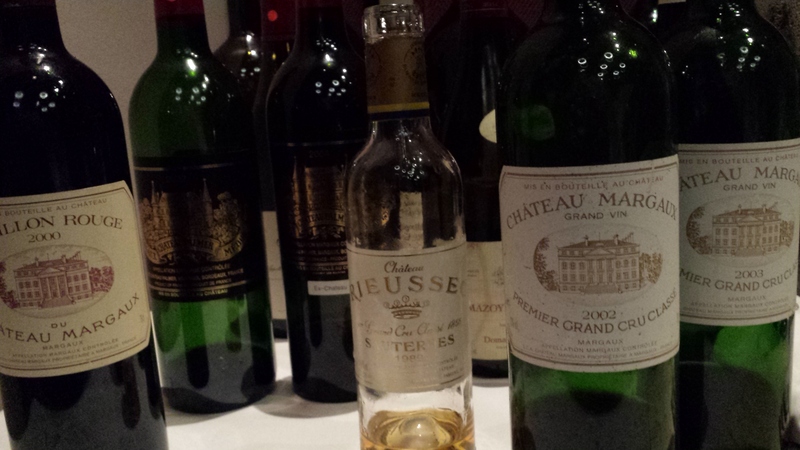 And, finally, a half-bottle of 1989 Ch Rieussec was consistent with my impression from a standard bottle 4-5 years ago, its acidity having ebbed away, robbing the wine of much of its verve, a pity since its apricot is still substantial. Given that there were so many of us, each person didn’t really have much to drink for each wine although I daresay there were some who staggered out of the restaurant. My thanks to everyone for their contributions.